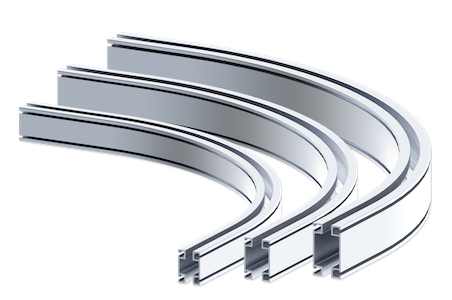 Knight’s RAD4112, RAD6112 and RAD7512 Curved Aluminum Rail Series has a curved radius enclosed track that is extruded from a lightweight, high-strength aluminum alloy. This rail design allows loads to travel around corners and stationary objects. 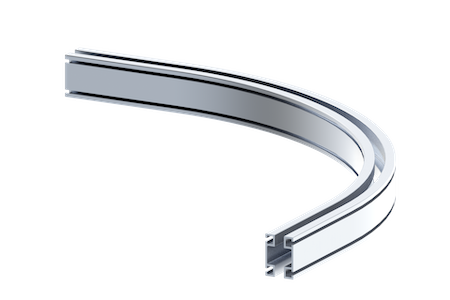 The Curved Aluminum Rail Series is the ideal solution for direct loads on single curved sections. This series, combined with nylon trolley wheels, provides the lowest rolling resistance in the industry. 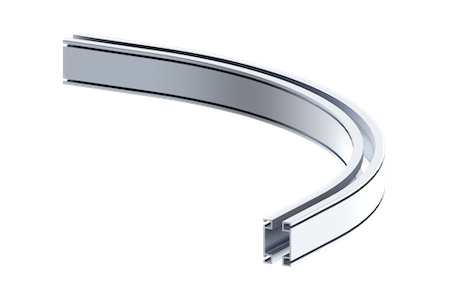 Contact a Knight Global representative for more information on Curved Rail accessories. 3 ft. [0.92m] Min. Radius. 8 ft. [2.43m] Max. Radius. 4 ft. [1.21m] Min. Radius. 5 ft. [1.52m] Min. Radius. 8 ft. [2.44m] Max. Radius. Load Trolleys and End Trucks are designed for cantilevered and direct load applications. All Hangers and End Trucks are designed to prevent binding of bridges and runways. 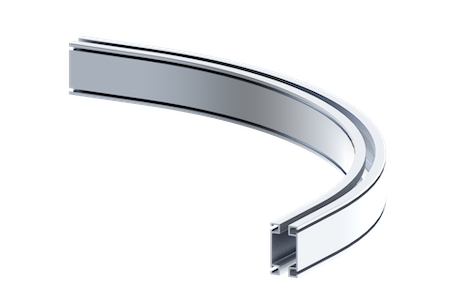 Accessories can be positioned along the rail, no welding required. *Due to Ergonomic considerations, each rail span distance is tested to determine the maximum single point load required to achieve a predetermined deflection based on a ratio of L/350 (1” of deflection for each 350” of length), L/450 (1” of deflection in 450” of length) or L/550 (1″ of deflection for each 550″ of length). 250 lb. (113 kg) mass x 0.017 = 4.25 lbf (1.9 kg) to overcome inertia. 4.25 (1.9 kg) x 0.35 = 1.48 lbf (0.67 kg) to sustain movement. Elastic deformation: This type of deformation is reversible. Once the forces are removed, the object returns to its original shape. The elastic range ends when the material reaches its yield strength. At this point tic deformation begins. Plastic deformation: This type of deformation is not reversible. Once an object reaches this point, it will not return to its original shape. Plastic deformation ends with the fracture of the material. Knight Global follows material handling industry standards in determining the capacity ratings for enclosed track overhead workstation crane systems. Each component (e.g. rail, hangers, trolleys,etc.) is individually tested to establish its ultimate failure point. From this number, a safe working load is then assigned to the component. Each rail span length is then tested to determine the maximum single point load required to achieve a predetermined deflection based on a 1:350 ratio (1″ of deflection for each 350″ of length). The recommended rated capacity chart is based upon single point loading for the listed spans.